At a point in the season when veteran experience is the commodity a Stanley Cup Playoff contender can't get enough of, the Colorado Avalanche have a valuable presence protecting their blue line in Shane O'Brien. With eight games remaining and the eighth-place Avs locked in a frantic battle for one of the final Western Conference berths, the 28-year-old from Port Hope, Ont., can draw upon his past experience in stretch runs with Tampa Bay, Vancouver and Nashville. O'Brien has suited up for 40 postseason games with those clubs, making it as far as the second round each of the past three springs. "I just tell the boys that there's nothing to save it for here -- we've got to dig in every night, leave it all out there," O'Brien told NHL.com during Colorado's recent East Coast road trip. "We're in a situation where we can't take nights off and we can't take shifts off. Anything I can do to help the boys realize how desperate and urgent we have to be, hopefully that will help us down the stretch here." By the time Shane O'Brien signed with the Avalanche on July 13, 2011, a familiar face was already waiting for him on the Colorado roster. Twelve days earlier, the Avs had inked veteran netminder Jean-Sebastien Giguere to a two-year contract to back up Semyon Varlamov. Once teammates when O'Brien was a rookie in Anaheim, the 34-year-old Giguere has proven invaluable during his first season with Colorado, winning 15 games with a 2.15 goals-against average and .923 save percentage, and helping keep the team in the playoff picture when Varlamov struggled to find his game during the first half. 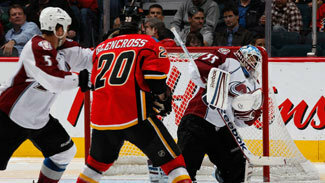 "Having Jiggy in the room is great for us -- he's been great for Varly," O'Brien said. "He came in and played some big games for us and kept us in the mix. Jiggy's a great guy in the room. Anyone who's won a Stanley Cup and a Conn Smythe, anytime you can have a guy like that in your dressing room and around the boys, it's great. Not only is he good for Varly, he's great for the whole team." Colorado returns home to the Pepsi Center on Tuesday night to host the Calgary Flames in a game with tremendous playoff implications -- the Avalanche could find themselves in seventh by the end of the night if they win and Phoenix loses in Dallas, but they could also drop as far down as 11th if they lose. Led by a nucleus that includes Calder Trophy candidate Gabriel Landeskog, fellow first-round picks Matt Duchene and Erik Johnson, second-rounder Ryan O'Reilly and goaltender Semyon Varlamov -- none of whom has reached his 24th birthday -- the Avalanche, by average age, are the NHL's youngest team. Just three players are older than 30 -- captain Milan Hejduk (36) and two other free-agent signings from this past summer, backup goalie Jean-Sebastien Giguere (34) and defenseman Jan Hejda (33). As it stands, Hejduk, Giguere and forward Chuck Kobasew are the only Colorado players who have participated in more postseason games than O'Brien. "Any time you can get some playoff experience, that's what it's all about," he said. "The regular season's obviously a grind. You've got to be a good regular-season player, but I think if you ask anyone, playoff hockey's what it's all about. I've been lucky enough to play on teams that have been in the playoffs and had a little bit of success, so it's definitely nice to have that going for me." O'Brien also has size and snarl working in his favor -- he's 6-foot-3, 230 pounds, and not afraid to mix it up in front of the net or in the corners, as his 785 penalty minutes in 448 career games will attest. "He brings a lot more than that, too," Landeskog told NHL.com. "He can really skate and really move the puck. He's good in our own zone and really plays that physical game. He's a veteran presence, that's really needed in the room, too. He's a leader on the team and really keeps the guys loose, kind of joking around all the time. It's a lot of fun." O'Brien is still looking to stick long term with an NHL team, though. An eighth-round selection by Anaheim in 2003, he broke in with the Ducks during their 2006-07 championship season and played 62 games, but was sent to Tampa Bay at the NHL Trade Deadline. He had settled in as a regular on the Lightning defense by the time they opened the 2008-09 season in the Czech Republic, but after skating in the season opener learned he had been dealt to the Canucks. "I was over in Prague so I flew from Prague to Tampa, which is like 10 hours, and slept for about four or five hours, got the phone call and then flew from Tampa to Vancouver, which is like another seven hours," O'Brien said. "It was definitely a tough situation, but those things make you stronger as a person and a player. I got to go to Vancouver on a really good team and had a couple good years there." The Canucks moved O'Brien to the Predators prior to the start of the 2010-11 season, and he was part of a Nashville squad that won the first playoff series in franchise history. O'Brien raved about the professionalism of the organization and how much he enjoyed playing there, but when he wasn't offered a new contract this past summer, he signed a one-year deal with the Avalanche, who are bidding for the second postseason appearance in Joe Sacco's three years as coach. It's been a good fit for both parties, as O'Brien has formed a solid pairing with third-year defenseman Ryan Wilson and chipped in with 16 points, 130 hits and 78 blocked shots while seeing the fourth-highest average ice time on the team. "It's definitely been a great situation for me," he said. "Coach Sacco's given me a great opportunity here. 'Sly' (Sylvain) Lefebvre, our 'D' coach, has been great with me. We've got a great bunch of guys, we've got a young team, and hopefully we can work something out because it's been great for me and I'd love to stick around here. I think the Avalanche organization is heading in the right direction."